On March 22, 1936, Bryant Tyrrell traveled to the farm of Hiram Brown near Chestertown, Maryland, to investigate a report of a bald eagle nest. Upon entering the colonial-era manor house built in 1708, he was shown into the sitting room and led to the large wooden mantle over the fireplace. There he was proudly shown four sets of marks that had been etched into the wood. The marks spanned 7 feet 1 ¼ inches, 6 feet 11 ¾ inches, 6 feet 10 ¼ inches, and 6 feet 9 ¾ inches. Mr. Brown explained that these marks recorded the wingspans of four eagles that had been shot on the property, trophies of past family adventures. 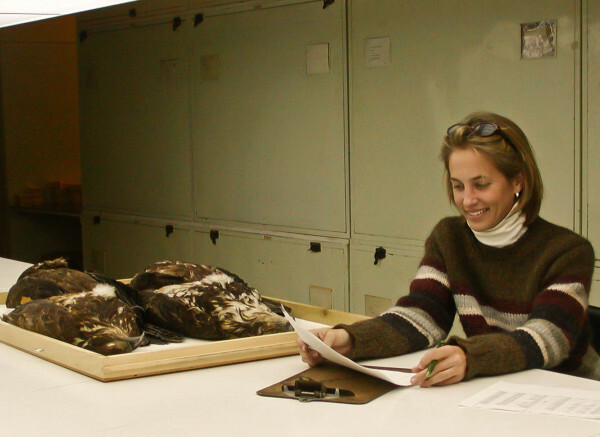 Catherine Markham (CCB graduate student 2001-2004) catalogs eagle specimens taken within the Chesapeake Bay during the “killing time” and now housed within the Smithsonian collections. Photo by Bryan Watts. 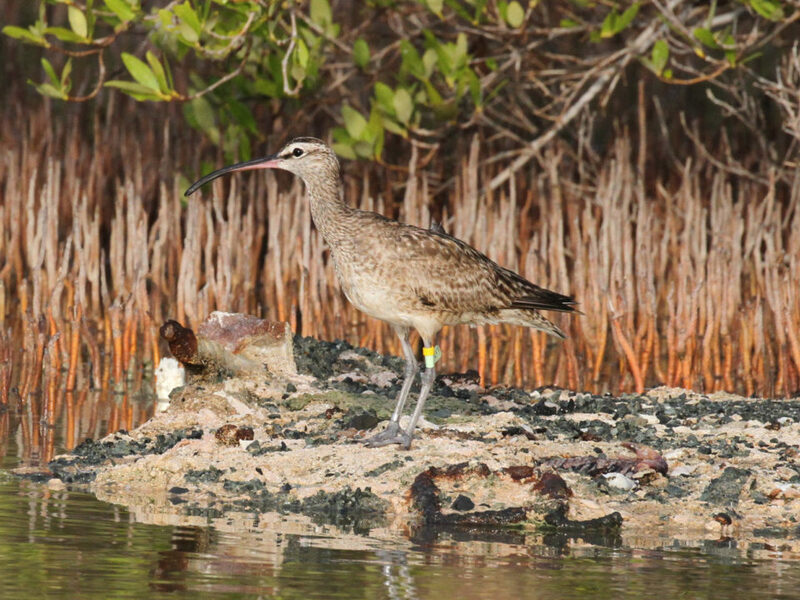 Just nine days later on 31 March Tyrrell was taken to a nest constructed in a dead American chestnut on Eagle Point along the Bush River. The nest was on Edgewood Arsenal, a government facility established to produce mustard gas following the entry of the United States into World War I. Although a single adult eagle was seen in the territory, the nest had not been used since an adult was shot there two years previous. On this same day, Tyrrell was led to a second nest on the arsenal. 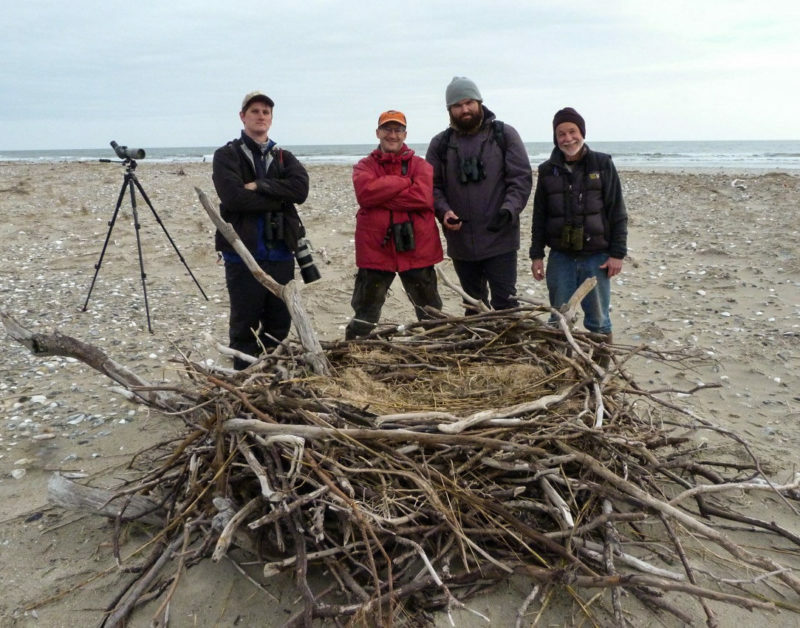 The nest was built in a large oak on Robbins Point and was also abandoned. He was to discover later in December that 3 young birds were killed there by hunters who believed the birds were feeding on ducks. Examination of their stomachs revealed only fish. 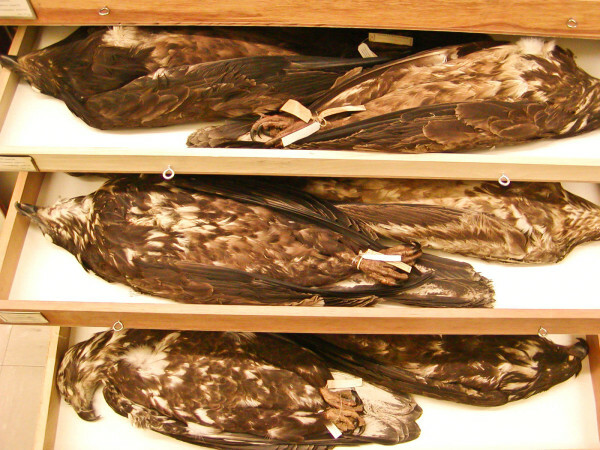 Drawer upon drawer of eagle specimens are maintained by the Smithsonian Institution in Washington, D.C. Each has its own story to tell. Photo by Bryan Watts. On 14 April John Shelton led Tyrrell down a long foot path to High Point. High Point is a bluff overlooking Belmont Bay where Occoquan Creek enters the Potomac River east of Washington, D.C. The commanding view over a large expanse of water and abundant prey attracted eagles like a magnet. On this day, Shelton would take Tyrrell to a tremendous American chestnut tree that had recently died from chestnut blight. The tree towered over the surroundings and was the primary eagle perch on the bluff where birds came and went throughout the day. Shelton indicated that he knew of more than 50 eagles that had been shot from the tree, and during their visit the two men found a fresh carcass on the ground. Thirty years later this site would become Mason Neck National Wildlife Refuge. 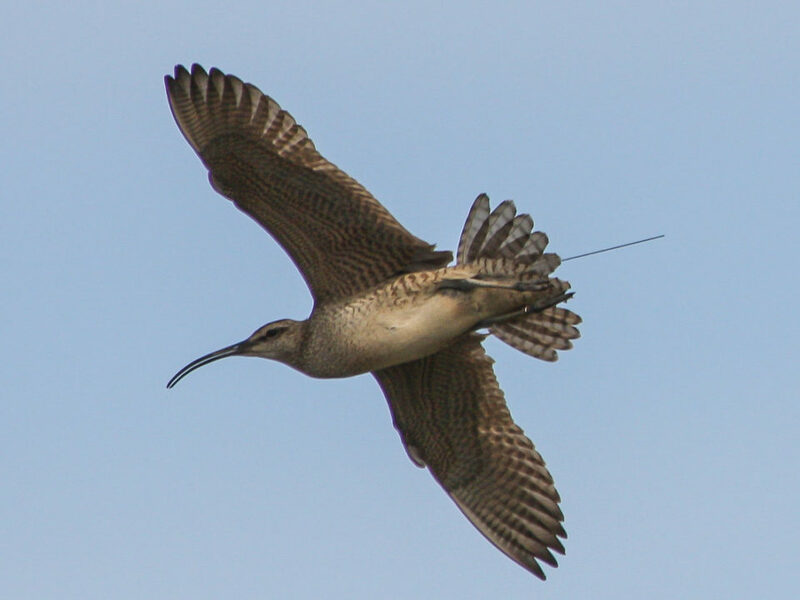 On 7 May George Frederick took Tyrrell to a nest on Upper Chippokes Creek near Claremont on the James River. Mr. Frederick, who ran a line of several hundred muskrat traps along the upper James, had previously killed one young in the nest but the second remained. 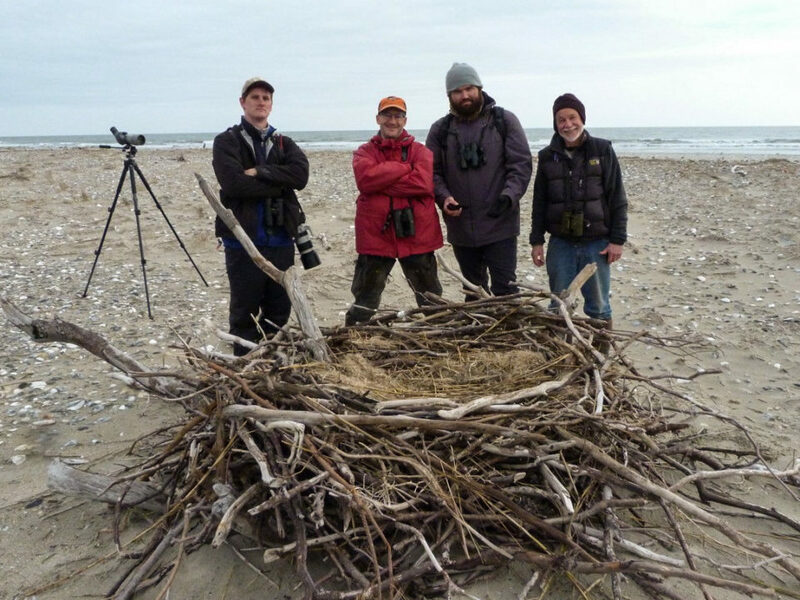 He explained that the attitude toward eagles in this part of the Bay was very poor. Eagles regularly discovered muskrats in his traps and would make a meal of them, damaging the pelts. He estimated that he lost ten muskrats weekly to eagles, amounting in a total loss of more than ten dollars per week. When partially-eaten muskrats were found, the local practice was to set several additional traps around the kill so that when the eagles returned they would be caught and later shot. 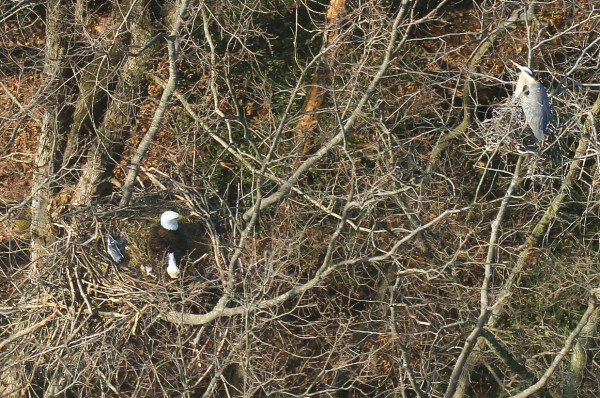 Current eagle resident of High Point incubates eggs along the Potomac River. The birds now share this landmark with a colony of great blue herons. Photo by Bryan Watts. 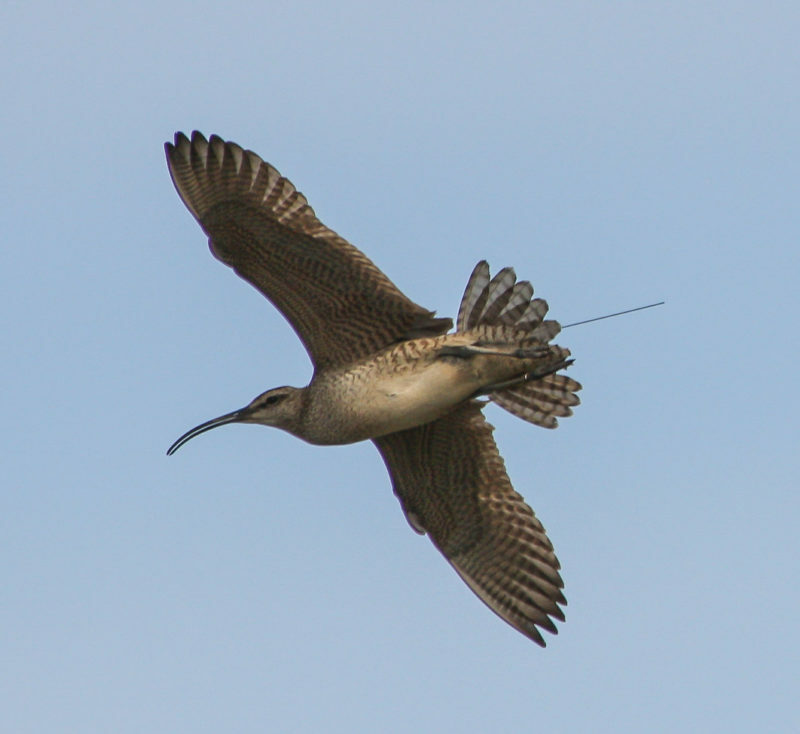 On 9 June, Howard Green took Tyrrell to a nest on Ordinary Point Farm along the Sassafras River. 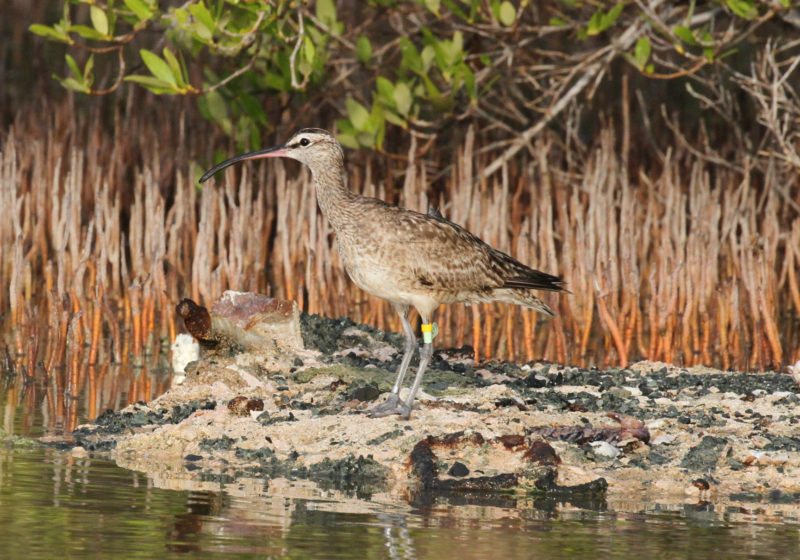 Mr. Green was surprised to see 2 large young in the nest and said he would return the next day with a rifle to kill them. On this same day, Tyrrell met Roy Mitchell who owned a farm on Freeman Creek along the Sassafras. Mr. Mitchell indicated that earlier in the season he had seen an adult eagle catching his chickens and so had killed the young in the suspected nest on his property. 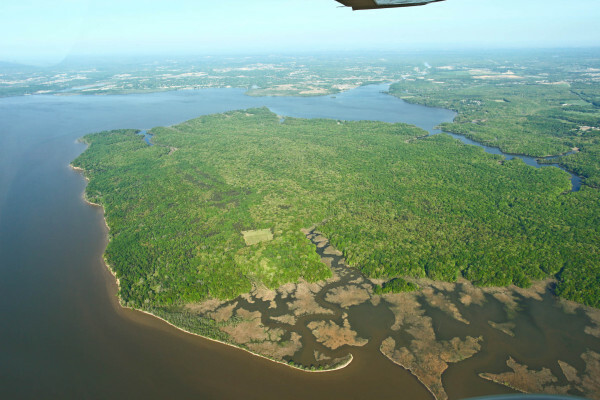 Aerial view of Mason Neck National Wildlife Refuge in spring that now provides an extensive buffer around High Point on the southeast corner (upper left) where Occoquan Creek enters the Potomac. Photo by Bryan Watts.